Gabriel (Gabi) Baramki passed away on August 30, 2012, at the age of 82. 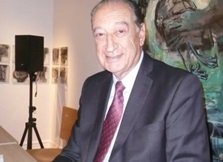 A highly-respected Palestinian intellectual, Baramki served as both Vice President and acting President of Birzeit University in the occupied West Bank, where he developed the university's first degree-granting program in 1972. He co-founded the Palestinian European Academic Cooperation in Education Program and the Palestinian Council for Higher Education. In 2009, he published "Peaceful Resistance: Building a Palestinian University Under Occupation." Baramki was renowned for his efforts to promote and defend Palestinians' right to education under occupation, including leading marches against the closures of universities by Israel during the first intifada, and to maintain the academic independence of Palestinian educational institutions. In response to these acts, Israeli forces repeatedly raided and closed Birzeit University, as well as beating and jailing Baramki. Born in Jerusalem, Baramki and his family were forced to flee to Gaza in 1948, victims of the ethnic cleansing of Palestinians that accompanied the establishment of the state of Israel. For the rest of his life, he was denied the right to return to Jerusalem and to his family's home, built by his father in 1934. Instead, the Baramki home was turned into a military outpost by the Israelis, then later into the "Museum of Understanding." It is now called the "Museum on the Seam." Both his father, Andoni, and Baramki himself waged tireless battles inside and outside of the courts to have their home returned to them, all without success. In exile since 1948, Baramki was only permitted to visit his own home once, in 2000.